- by EIN contributor Harley Payette. I was inspired to write this by yet another message board discussing Elvis' worst movies. Someone threw in the standard line: "They were all bad." And of course some people even agreed with it. This is a common perception that is out in the general public but I was surprised to find it amongst genuine Elvis fans. Sometimes it seems that we're too fond of pointing out how Elvis' movies don't measure up to the standards of movies at large. Since Elvis was such a massive talent and he spent a large part of a relatively brief career (compared to Sinatra, Crosby, McCartney et al) playing in movies that were generally not equal to his talent, his movies have gotten a bum deal. However the fact that Elvis' movies were not all great does not make them bad. When someone says that "all of Elvis' movies were bad" I wonder if that person has ever seen a bad movie. If you look at Elvis' movies only "Kissin' Cousins" and maybe "Harum Scarum" and "Tickle Me" are marked by the kind of amateurishness of say an Ed Wood or a Jess Franco or any of dozens of other cut-rate filmmakers who made plenty of bad movies far worse than anything Elvis ever did. Only "Paradise Hawaiian Style", "Clambake" and "Spinout" are polluted with the kind of deadening, big-money-gathered-for-no-reason Hollywood malaise that infects movies like "Stroker Ace" or "Harlem Nights". There are maybe two or three others ("Stay Away Joe", "Easy Come Easy Go") that misfire badly. But that's only 8-9 movies out of 31! 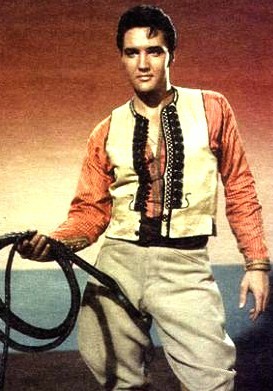 The vast majority of Elvis' movies hit their targets. To say something like "Blue Hawaii" is a flat out bad movie indicates an ignorance of the movie industry and a snobbish refusal to be entertained. Even 44 years later, you can see why "Blue Hawaii" was such a big hit. There are beautiful locations, beautiful people having a good time, and some nice supporting performances. There are 14 mostly pleasant songs performed absolutely splendidly by Elvis. If you watch "Blue Hawaii" when it comes up on one of the movie channels on a cold day in January, it's very easy to enjoy for those reasons, the same reasons a show like "Baywatch" is such a worldwide hit. It gives you a taste of something better when you're feeling bad. Like "Baywatch", "Blue Hawaii" was not a meant to be a breathtaking extravaganza like "Seven Brides for Seven Brothers" or "West Side Story". It was meant to be a pleasantly diverting star vehicle. And in comparison to other like movies, it holds up quite well. I wouldn't say it is up to the Day/Hudson/Randall collaborations but they were they were the height of the classic star vehicle. However, if you line it up against say Jimmy Stewart's "Mr. Hobbs Takes a Vacation" it acquits itself quite well. And versus inferior Doris Day imitations like the Darin/Dee films "If a Man Answers" and "That Funny Feeling" it is much better. And it is also far superior to its own imitations like the Avalon/Funicello beach films. Better star, better actors, better locations. The comparison to the Stewart movie is especially important in that reminds us that Elvis was and is not alone in making "star vehicles". They are with rare exception, along with blockbuster extravaganzas and teen exploitation films, the heart of the industry. This does not make "Blue Hawaii" a good film. But it does not make it a bad one either. Most of Elvis' movies fall into that middle ground and it's the failure to see that this middle ground exists which is at the root of Elvis' cinematic reputation. However, the dirty little secret is that the vast majority of movies in general fall into this category. It's not hip to say this, but as far as 'star vehicles' go most of Elvis' movies are very successful in that if you like Elvis, most of the time you will enjoy the movies. Very few Elvis movies fail to hit this mark and the best of the star vehicles like "Viva Las Vegas" and "Fun in Acapulco" exceed the mark. "Viva" is so well done, it actually wildly exceeds it. And that mark was not, and is not, considerably lower than the rest of the industry. ...to the ridiculous 'Harum Scarum' in 1965. Compare something like "Kid Galahad" to say Eddie Murphy's "Coming to America." The plot of the Murphy is even more cliched than the plot of the Elvis movie. However, both movies are better than average star vehicles because of the personalities of the lead performers, some nicely drawn characterizations, a recognizable milieu and even some little insights to the world at large. The points in the Murphy movie are about a quiet pursuit of the American dream. The points in the Elvis movie are about small town life and the American melting pot. The otherwise astute Dave Marsh calling Elvis' movies the feeblest group of star vehicles in history makes no sense. Perhaps Mr. Marsh can be forgiven because he wrote his remarks before that great run of Bruce Willis' movies in the mid-90s or that string of dopey action vehicles where Nicholas Cage wasted his talent after "Leaving Las Vegas". However the year his book came out "Stroker Ace" was released the height of a string of Burt Reynolds movies that redefined the concept of bad! The one thing that you can definitely say about Elvis' movie career is that he never made one truly great classic movie to rank with say "The Godfather", "Gone With the Wind", "Goodfellas", "The Searchers" etc. However this does not mean he did not make any good movies. This is where refusing to see things in degrees obfuscates the work. Just as relatively few movies are bad, very few movies succeed at the level of "The Godfather" and the actors that appear in those movies are blessed. There are Presley movies though that, even if they don't reach those Olympian heights, raise their heads above the fray. 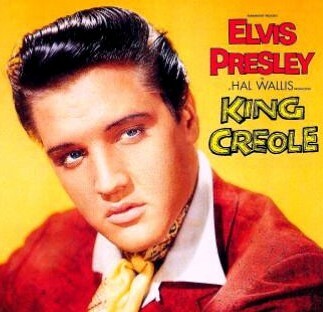 I don't think it should be controversial to say that Elvis made some quality movies and I would argue the case of "King Creole", "Follow That Dream" and "Jailhouse Rock" being very good movies. These films are all in some ways flawed but they are also, but for the most obstinate viewer, rewarding movie experiences. They are well-directed, well-acted and in general interestingly plotted. Are these elements as good as "The Godfather"? No, however there is room for real quality below that level. While "The Godfather" is a room at the Waldorf Astoria, these movies are the mom and pop across the street with a clean room, a comfortable bed, a TV and room service - all you really need if not all you could absolutely want. Can anybody seriously argue that "King Creole" or "Follow That Dream" are not as good as much beloved good movie like "The Longest Yard"? The budgets for all of Elvis' Paramount movies and all of his movies for other studios up until "Kissin' Cousins" were very reasonable for the time. It's difficult to appreciate now, but in that era Hollywood elected to make its money with a lot movies making a little money rather than a few blockbusters making a ton. There was the occasional extravaganza like "Ben Hur" or "The Ten Commandments" but most movies were, compared to now, modest in financial scope. Elvis' movies were, at least until the end, quality products. The character actors like Angela Lansbury, Lizbeth Scott, Burgess Meredith, Roland Winter, Arthur O'Connell, Walter Matthau (not yet a star but a recognized character pro when "King Creole" was made), Dolores Del Rio, John Ireland etc. didn't work for nothing. 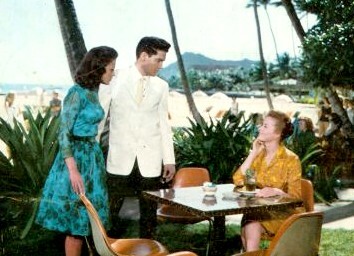 Many Elvis movies were shot on location in Hawaii, in New Orleans, in Seattle. The only thing that stopped "Fun in Acapulco" being filmed in Mexico was the Colonel's reluctance to let Elvis leave the country - or possibly The Colonel's own passport dilemma! 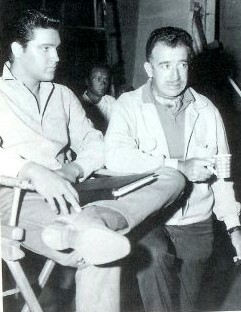 Elvis' directors although not top-tier were also industry pros. 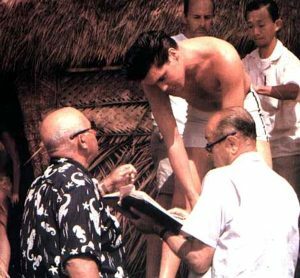 Not only Michael Curtiz but also Don Siegel (left in photo with Elvis) who was just on his way up although he had already directed "Invasion of the Body Snatchers" on a lower budget than any Elvis movie. There were also other directors like Gordon Douglas, George Sidney and Phil Karlson were recognized pros. The screenwriter on "Follow That Dream", Charles Lederer, was one of the all-time greats. Did they do their best work with Elvis? No. But, their participation indicated certain minimums of professionalism. Also, budget has traditionally been only a small inhibition of quality. With all of this I want to be careful. I don't mean, by any stretch of the imagination, to paint the picture that Elvis' movie career was a triumph. It was a missed opportunity. However, I think it's very unfair to paint it as a joke as it has so often been done. I would say Elvis made about eight movies I would consider good movies, with about 15 others like "Blue Hawaii" at the very least watchable - a not inconsiderable achievement. 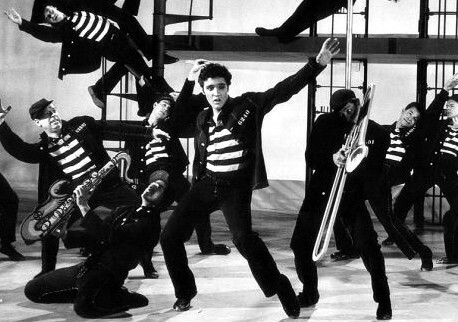 Both "Jailhouse Rock" and "Viva Las Vegas" make lists of 'essential films'. Fans of course have a right to complain about Elvis' movies. With such extraordinary talent Elvis shouldn't have been wasting time on anything average or lightweight. (Although that would also apply to pure studio music like "Good Luck Charm.") But it's time for real Elvis fans to stop acting like it was amateur night.